This entry was posted in Birds (鳥), Photography (写真) and tagged aquatic birds, カワウ, birds, 野鳥, 鳥, great black cormorant, great cormorant, 川鵜, 水鳥 by T Ibara Photo. Bookmark the permalink. Oh, somebody got lucky! 🙂 I saw a diving cormorant the other day. He was under water for a half a minute each time. It was not easy to catch that fish. What a gorgeous action photo. Thank You showing it. Thank you! I am very happy you enjoyed these Great Cormorants. They are clever and strong birds 🙂 Wish you and your family a good week too! What a capture of the dynamism of the hunt! I can even see the mullet’s tail flapping! Hello Atreyee, thank you so much for stopping by! I’m glad you enjoyed this image! Great cormorants are pretty amazing birds (but often under-appreciated) and I hoped to bring some attention to them. The “hunt” was heart-pounding, and I really felt for those mullets! Mission accomplished Takami! They are gorgeous and I would love to see them in real life. Lovely dynamic image. Did they catch anything? Fantastic action! What a capture! Great capture. I like the dynamics of the birds. Thank you, I’m happy you liked it. Cormorants are pretty amazing birds. It’s quite remarkable how agile some birds are in the water! Thank you Donna! Cormorants are pretty amazing birds! So beautiful an full of movement. ❤ Wonderful. You captured the motion so beautifully! Hugs on the wing. Hi Takami, another action picture of nature at it’s finest. Very nice. 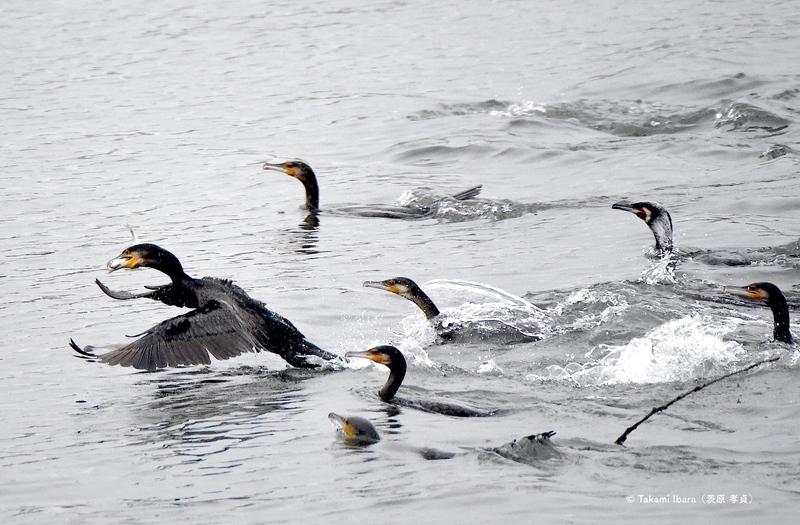 Impressive Cormorant capture! I have often tried to catch them catching fish but so far not much luck. Kudos to you! Cormorants are under-appreciated (often they are seen as nuisances here) and I wanted to show my appreciation for these amazing & resilient water-birds. I came upon this “hunt & chase” scene unexpectedly. It was late afternoon at a nature reserve, grey day, and everything seemed very quiet. Suddenly, dozens of Great cormorants formed an army (navy?) and went on a feeding frenzy. It was quite heart pounding. I can’t imagine how terrifying it must have been for the fish!! Silver birds in a silver lake ! Glorious !